Oxylabs provides business intelligence data, offers premium-level proxies and enterprise-level support. Their team has decades of personal experience in web data harvesting and extraction industry, so they know what works best. Oxylabs is a leading tech company specializing in large-scale web data extraction and has helped numerous industry leaders. They own a pool of more than 1.5M data center IPs and a residential proxy network with more than 30M residential IPs from all 195 countries around the world. Oxylabs also offers worldwide city level targeting with 24/7/365 uptime and have 24/7 enterprise-level support. All pricing plans come with limited bandwidth. You can choose from five different pricing plans starting from $600/month with 50GB included. Check them out here. As you can see, Oxylabs clients pay per GB. As their website suggests, Oxylabs has 30M residential IPs. Oxylabs claims that they have residential proxies from any country and city in the world. You can find an interactive map on their website and check how many IPs they have in each country. After you buy a proxy package, you get a username, password and the main entry point (gateway). You can take this entry point, add special parameters to your username and filter IPs by country, city or ASN. You can also create a session and maintain that session for a custom time. Also, with your proxy package, you get other entry points which are already filtered by country. Both credentials (username: password) and whitelisted IPs are available. Keep in mind that if you’re using whitelisted IPs, you won’t be able to add parameters to your username and then filter proxies. But you can use entry points that are already filtered by country. Yes. You can create as many users as you want. Traffic will be counted separately for every user. Yes. You can use special parameters with a random id added to your username to create a session and reuse the same IP address. You can even choose how many minutes a session will hold the same IP. Location. Yes. You can filter by country or city. ASN/Provider/Carrier. Yes. You can filter by ASN. Oxylabs supports HTTP and HTTPS protocols. When you buy a proxy package from Oxylabs, a customer support representative is assigned to you. So, in case you have any issues or questions, you communicate with your account manager, that’s why you won’t find the usual features such as support tickets or live chat on the Oxylabs dashboard. To be honest, when we first learned that Oxylabs doesn’t use support tickets, we were ready to lower their rating. However, after trying out how Oxylabs support works in real life, we were pleasantly surprised. Since you always speak with the same person, he or she knows which problems you had in the past, so you don’t have to explain them from the beginning. Communication is smooth and professional. Even when we asked technical questions, we got fast and well-explained answers. 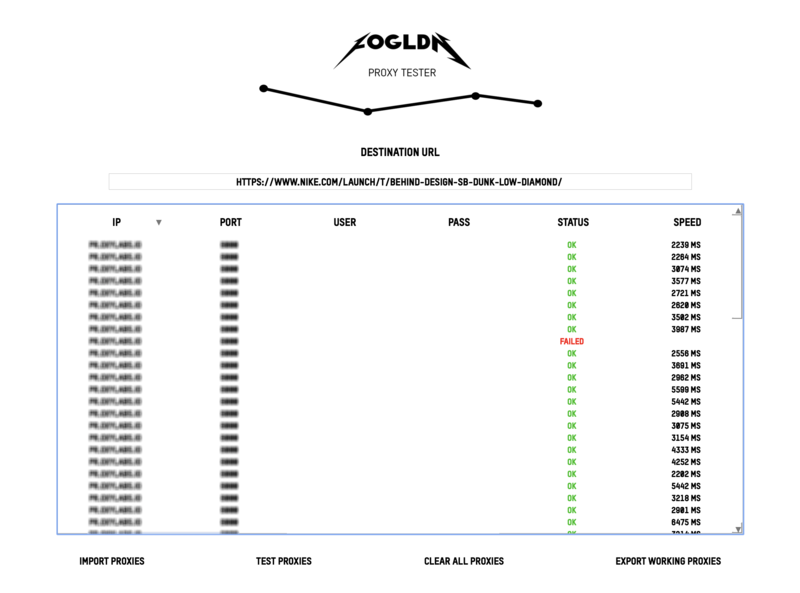 We checked the proxy speed using the free FOGLDN Proxy Tester. The test showed us that Oxylabs residential proxies are quite fast. The average response time is 3-4 seconds. Would we recommend using Oxylabs residential proxies for sneaker copping? Yes, they are definitely a good choice. Oxylabs residential proxies performed really well with an average success rate of 84%. 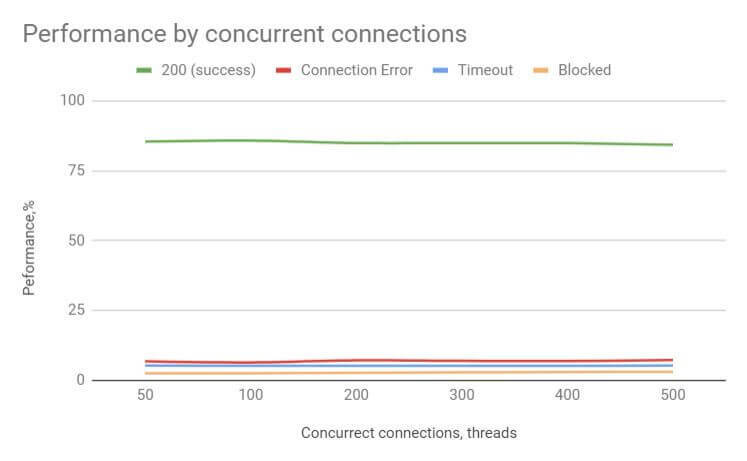 As you can see, no matter how much we increased the concurrent connections, the connection error rate stayed very low. There were only a few timeouts and blocks. In the graph below, you can see a detailed breakdown of the performance test results. We used a 300 concurrent connections’ benchmark. Overall, Oxylabs residential proxies had a very low connection error rate. There were some timeouts, but not too many. Only with Google and Wayfair, we got some blocks. When it comes to extracting data from complex websites such as Amazon, Oxylabs residential proxies perform very well. As you can see from the table below, with Google, the 503 (recaptcha) error was the most frequent. With Wayfair, we got almost only the 403 error. As for the average response time, compared with other proxy providers, Oxylabs residential proxies perform pretty well. See the graph below. 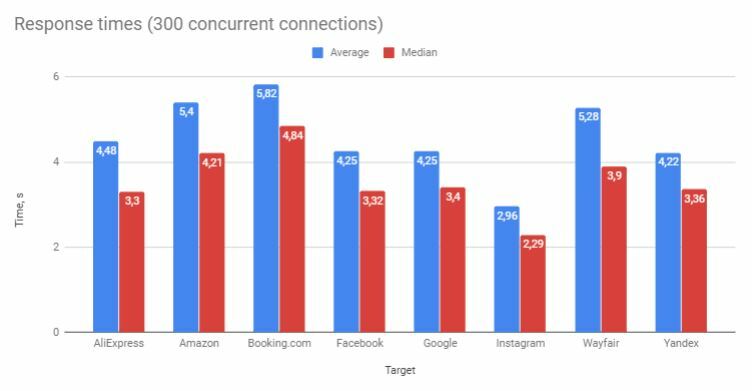 As you can see, the average response time and median are impressive for residential proxies. There is only a small difference between the two, but it’s completely normal for this type of IPs. We’ve mentioned this in other reviews, but the best way to test how proxies will perform is to check the average response time on Amazon. This site is a difficult target because requests to it contain a lot of data and if proxies are slow with Amazon, they will be slow with other targets too. As you can see, the average time on Amazon was only 5.4 sec. So, when it comes to customer support, Oxylabs exceeded all our expectations. Having a dedicated account manager proved to be very useful and made our communication with them extremely easy and smooth. Overall, we think that Oxylabs offers professional and high-quality proxy services. They have almost all the features that we include in our other reviews. Only proxy type filtering and SOCKS5 support are missing. Oxylabs has a big country/city coverage. You can create as many sub-users as you want, they offer the session control feature and authorization with both credentials and whitelisted IPs. Also, their dashboard is simple and stylish. Oxylabs residential proxies have a very high success rate and impressive response times. So, with 4 different pricing plans (starting from $600/month with 50GB included) and a price dependent on the amount of bandwidth you require, this seems like a really good deal. 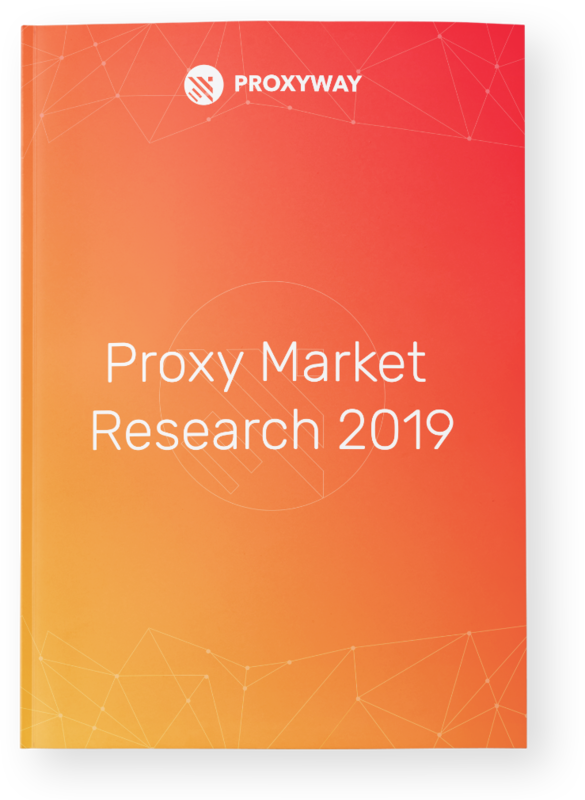 See the full list of the top residential proxy providers. See the full list of the top dedicated proxy service providers.